the Father has life in Himself, so He has granted the Son to have life in Himself. How familiar we are with scriptures such as this: the Father has life in Himself. As we read through Scripture we so often glibly read and continue to read, with little thought as to its inner depth and its extraordinary significance.. with little understanding of its outer extremity or its massive meaning. The Father has life in Himself. Nothing is necessary to God. He needs no food to nourish Him. He needs no water to sustain Him. He needs no air to remain breathing. He has no needs of cloths to keep Him warm or a home to abide within. He needs no friends to encourage. He needs no hope of Glory to rest in. He needs no scientific laws to survive. He needs no time, no heat, no light, no grace, no joy, no love – no life… God needs nothing. God doesn’t need you !! and He certainly doesn’t need me… !! 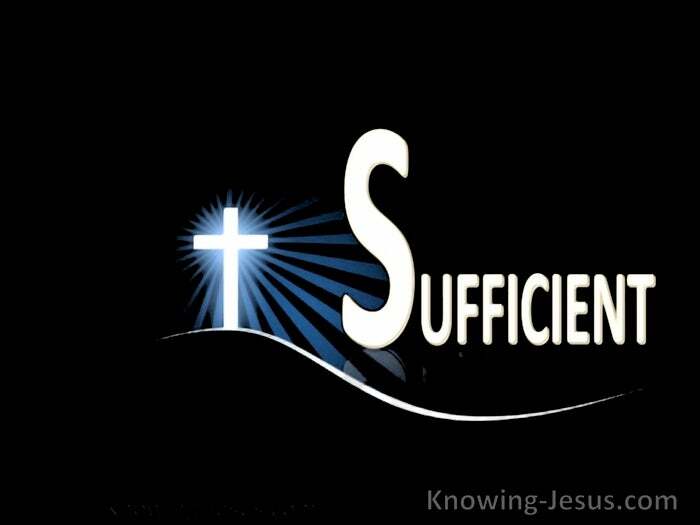 He is the All Self-Sufficient One. He is the High and Lofty One that inhabits eternity. All that God is and whatever God is comes from within Himself and no other. How different from the rest of creation for all things come from Him, and all things are held together by Him.. from the lowest form of life to the mighty cherubim and seraphim.. all have need of God. The man that who curses God, needs Him to provide his blasphemous breath. The atheist that ridicules God, needs to be sustained by His power each day. The saint of God who desires to give His all to God can only cry.. all things come from You and Own Your own do I give You back. The astonishing thing is that God in His self-sufficient wisdom and grace, has chosen to condescendingly work in and through His servants. but He has stipulated that His servants must be faithful and obedient. But the keyword here is faithful servants – obedient sons. Only faithful servants willingly submit to the leading and guiding of His Spirit. Only obedient sons choose to surrender to the guidance and leading of the Spirit. God has always worked through the small remnant.. a little faithful flock. Many are called to be sons of obedience but few choose to answer the call. Many Christians prefer a legalistic life to a life of spiritual faithfulness and grace. Many believers prefer a carnal life to a life of surrendered obedience and faith. Many live in defeated disillusion.. rather than glorying in Christ’s Cross..
For many saints don’t have a clue how to live the crucified life to God’s glory.. but in His love and pity God came to earth Himself as Christ. He came in the form of a servant to demonstrate obedience to those that believe. He came to demonstrate obedience and to show to how to live, to those that believe. Christ did not need to unveil perfect deity to mankind.. Christ rather came to demonstrate perfect humanity. So that all that believe would know HOW to live.. in spirit and truth.. how to say not I but Christ lives..
And all His life He only lived through the All-Sufficient Spirit living In Him.. demonstrating the only way that insufficient, created man should live his life.. demonstrating a life of utter and total submission.. demonstrating complete and perfect reliance and a willing dependence on God – demonstrating to imperfect man how to live a perfect life. For it is God that works in you, to will and to do for His good pleasure.. until it is no longer I that lives in this body of flesh, but Christ that lives In me and Christ that works through Me. 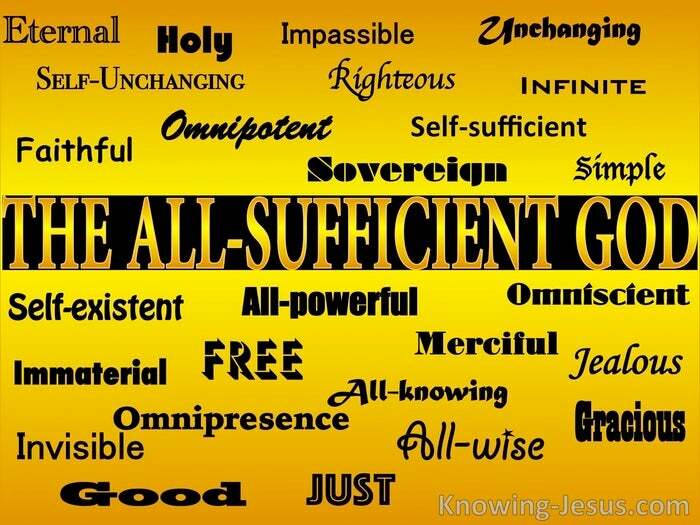 God is indeed the all-Sufficient One. He needs no one and no thing.. but when obedient faith is exercised in the spirit of humility and grace, God works through ANY one… even you.. and even me.